We all know of these guys. I bet some of you, just like me, loathe the idea of being in their hands. We all know that they are trained, in a certain way, one that makes them behave and act in a certain manner. Police are loved and hated with equal measure. We know them as agents of ensuring social order, but we also know them to be blunt crooks. Sunday morning (Feb 9,2014) at around 2am, we had an encounter with police. We were coming from The Nile Project Concert After Party with the band and support team, and police somewhere along the way to Ndere Cultural Centre stopped us. But before this encounter, we had just come from another with the police. They had just ordered the closure of the after party at the National Theater. And now they just ordered us to stop, again. We are stopped in the middle of the hill by a police check that is helping people enjoy life responsibly. They are helping drivers understand that it is in their benefit to “not drink and drive”. They have a checkpoint some place midway up the hill, where this this tall-dark-loud cop stops our car. He ordered the bus to pull to the side, then when it did, he bend over to look at the front left tire. His response was swift. He ordered the driver out of the bus, claiming that the bus cannot move anymore. 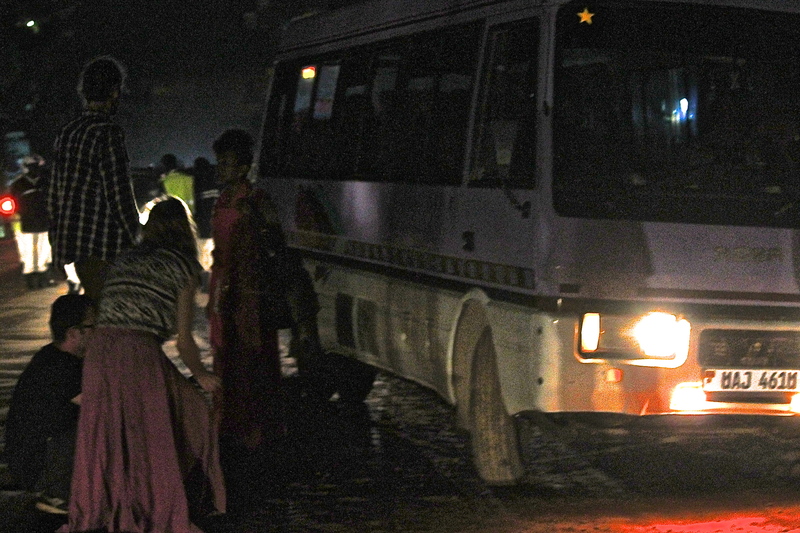 We all wondered why a bus we had traveled with so far could not move further, and I remember all of us not being amused with the cop stopping the bus and ordering the driver out. Well, it is possible that with our prejudiced attitudes, we might have thought the cop was asking the driver out of the car for him to ask or receive a bribe. Anyway, the driver got out of the bus and went over to look at the tire and for sure it had a problem. Some metal connector had dropped off and so the tire had maladjusted itself to the left. It was insisting on going left instead of going straight to the front. Actually, it was going left when the other tire was going to the right. We got out of the bus, and looked at it. It looked like it had spread its legs. I mean, you know when you put one leg on the left and the other one on the right, then you spread them from the middle, yes, that’s how the bus looked like from the front. Its front legs were spread. Miles, Yasin and Laura look at one of the spread foot of the bus. Immediately, we got boda bodas for the rest of the band to go home. We remained a few guys, some cool guys – Miles and Yassin, and some girl with a pretty heart – Laura . Kasiva, the Kenyan percussionist, was also asleep but woke up later to keep vigil with the guys watching over the dead bus till the other one arrived to take us and equipment home.We were left to hang around till the bus comes, and so we all found something to occupy our time. 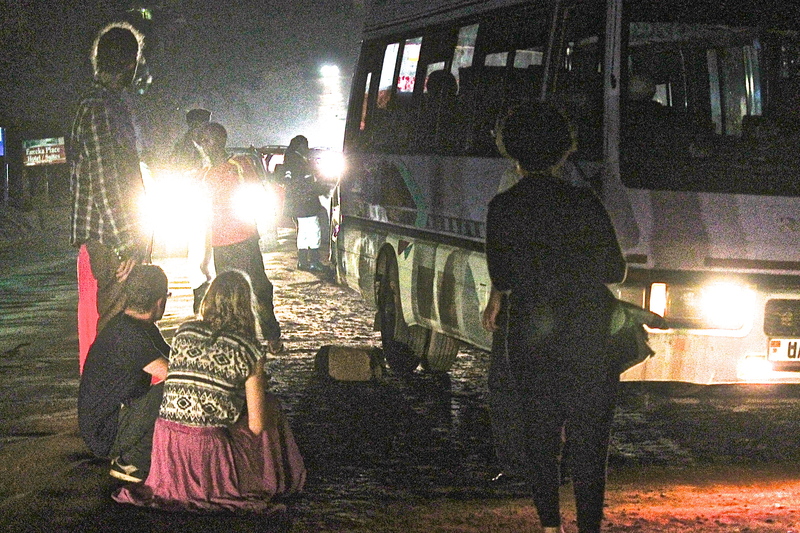 members of The Nile Project stand by the bus after it was stopped by cops and diagnosed with spread feet. In front of the spread tire is Meklit Hadero from USA/Ethiopia. 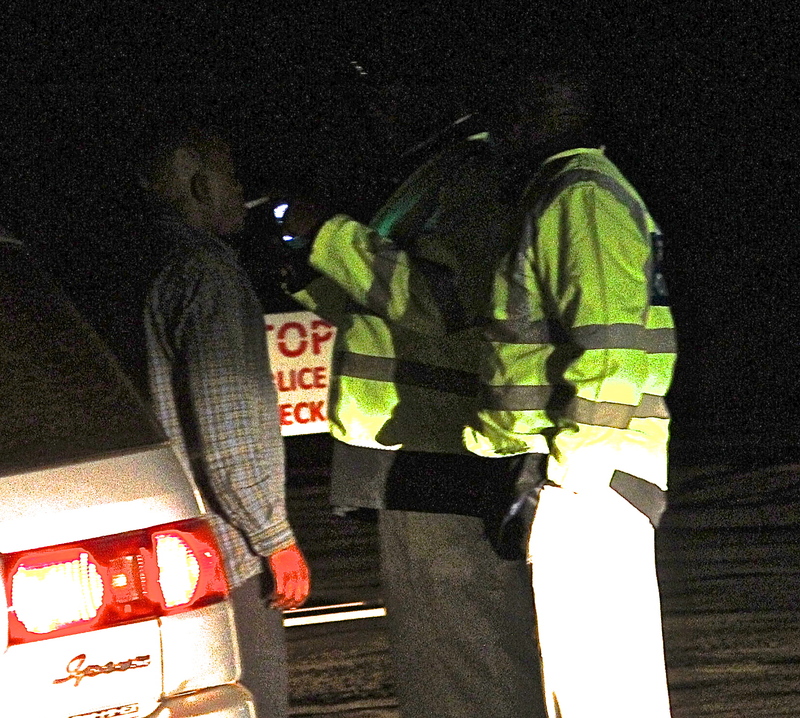 There is so much happening on this road, the police are implementing the alcoblow safety and responsibility thing. People are getting tested. Most FAIL the test, then they are asked to CONCEDE DEFEAT and sign some document (that you cant read at this time of the night), after which they are told that they are under arrest, then led onto a waiting police car, those blue double cab pick-up trucks with a double seat at the back. It was hilarious to hang around with the Uganda police and see the process of arresting people. It was comical and painful at the same time. A car would be ordered to stop. Then they would laughingly ask the driver to come out. The first batch of police would make jokes with the guy, and ask him to stand on one leg while making the joke. Then when he failed that test, he was passed onto the 2nd group, just like a joke, who would ask him to choose if to stand on one leg or have the alcoblow administered. At this time, the alcoblow team would bring the gadget, and force it on to your mouth and order you to blow in immediately (without showing you how it works or explaining the readings for below and above limits). They would stick it in your mouth and ask you to breath out. Then there is also some drama girls around. They have come, about 3 of them, from the club. One of them is demanding to be tested. She has been asking for it for the last 10 minutes and its not happening to her. They are not giving it to her. They are messing around with the boys in uniform. They are taken to that side and they come back to this side, then they go back to that side and come back again, feeling pretty. She has not been tested as yet. She pretends to be pissed off. Doesn’t look like they will be arrested. They are playful and dramatic. Looks like they will meet later, that baada ya kazi kinda meeting. I realize these boys in uniform are out having fun in the night. The police go out to also have fun and kill the night boredom messing around with you. They are not always serious about everything they are doing. They are flirty. Very flirty. They can easily close down work for a (good) flirt. I decide to also go flirting. I went to thank the police guy who stopped the car for stopping us. So, the police guy says, “don’t even thank me, you have just survived that down hill. And if you would have passed this hill, you all would not have survived the next downhill.” I thank him once more for stopping us, then I go back and lean on the bus. Its true what this cop says. Its also true that he is evidently harassing other motorists on this road tonight. He is also a bit rude and obviously patronizing. Its also possible he is instilling discipline in the process of harassing the people. One could also argue that they use “harassment” to instil and maintain social order. He is like-able and hate-able all at the same time. And that’s the life of a cop. They come from a family. They have a family. They are human beings who are trained into acting, behaving and doing like police. The other weekend my car was arrested for having a broken windscreen. Well, I couldn’t have fixed it in January; you all know how January feels like. So the driver was going to pick members of muthurukishion band when a police check nabbed the car. The bond was 10,000 Kenyan shillings, which I was given the option of paying immediately, either at the road or at the police station. I paid at the road and took the car home. The other night we were heading to the studio with a friend and police stopped us to check for safety belts along Ngong Road, Nairobi. Unluckily, our friends at the back of the car bad not belted. We had the option of not going to the police station instead of the studio, or working out a way of ensuring tat we still went to studio. We faked a “football superstar” character in one of the not belted guys to scare the cop away. The guy told the cop that “In the US, we dont necessarily belt up at the back seat”. Cop looked scared and bought the prank. So we drove off laughing. We have a love-hate-cunning thing going on with these guys, don’t we? Police. Characters that we have created in society. To guard us when we sleep over our lives. To arrest us when we want to kill ourselves. They are supposed to be caring and compassionate. Everybody needs to know a one. A bigger One. One that calls the one who has arrested you and orders him to release you “with immediate effect”. One that can handle your black mailers. One that can kill your insane neighbor at your request. One you can “lay” for uniform.